She’s been criticised for her outfits in the past, but Princess Beatrice was looking every inch the stylish royal as she stepped out in Barcelona on Wednesday. The 30-year-old made a glamorous appearance at the GSMA Mobile World Congress, where she delivered a passionate speech at the Women2Tech keynote and diversity panel titled Scaling your Business for Success. The young princess looked stylish and professional as she stepped out in a chic monochrome ensemble, which included a black blouse with a flared knitted skirt. She finished off the look with a pair of trendy black ankle boots and wore her long locks loosely out for the occasion. The princess, who works for business management consultancy Afiniti, delivered an impassioned speech on facing gender norms in the workplace and how she challenged them as a woman in the technology industry. “It was not until I entered the workplace did my understandings of the role of women play in businesses suddenly dawn on me,” she said, according to ENews. “This started to make me think how working for a technology company, I could begin to make a difference in challenging gender norms especially when it comes to technology, an area that has a reputation for being a boys’ club. Her glamorous appearance comes after she previously spoke candidly about the pressures she and her sister Princess Eugenie have faced in their own lives outside of work having grown up in the royal media bubble. Speaking in an exclusive chat with Thomson Reuters Foundation in November, 2018, Beatrice sent a powerful message to other girls going through similar troubles, telling them: “You are not alone. She told the news outlet she wants to help encourage youngsters to seek help, as while her own bullying was very public – other people’s may not be. 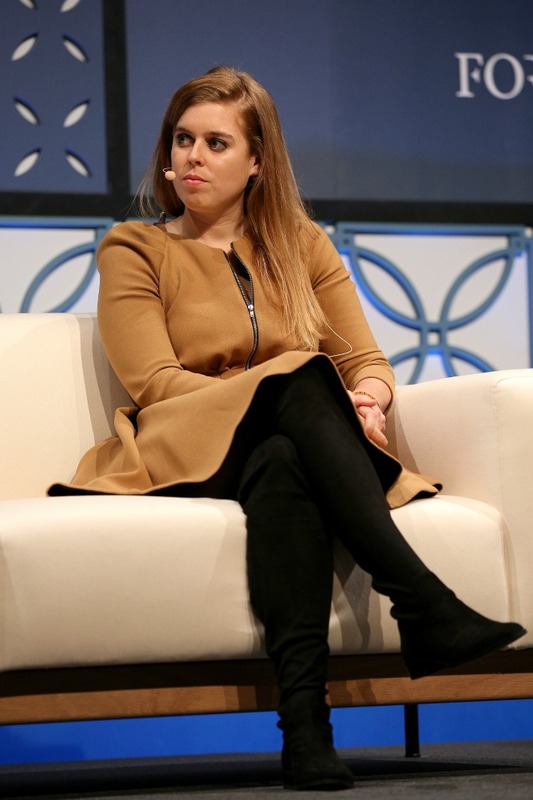 Princess Beatrice looked elegant as she spoke on a panel at the 2018 Web Summit. Source: Getty. Following her own difficult experiences of being targeted by bullies online, Beatrice has joined a number of campaigns and initiatives to stop cyber bullying, as well as co-founding the Big Change Charitable Trust with a group of friends in 2010, supporting young people in the public eye. Are you a fan of Princess Beatrice? Do you like her style?